I could listen to Jaime talk about her day job…well…all day. What is it about museums that seem so romantic? 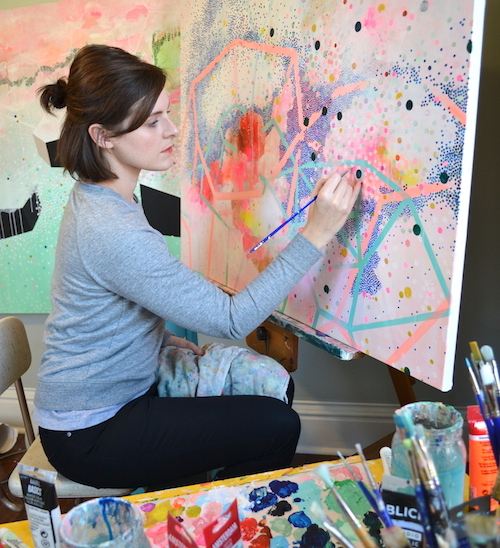 In addition to that career, she is also an artist and a mom. How does she balance it all? I’ll let her tell you. Welcome, Jaime! We’re so happy you’re here. Hey everyone! I’m Jaime. 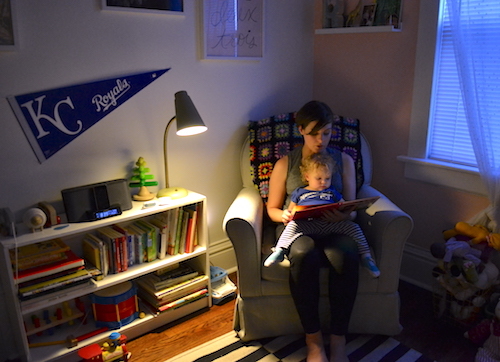 I’m an artist, museum professional, and working mama from Kansas City. I’m doing my best to juggle a growing creative career with my day job that pays the bills…and student loans. 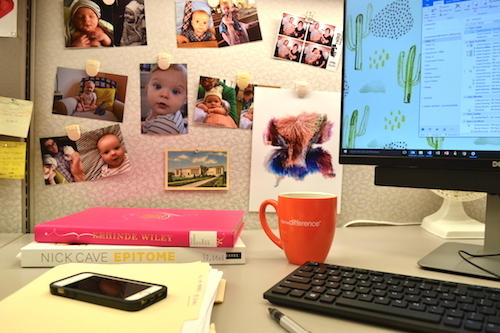 From my cubicle to yours, here’s what a day in my life looks like. It begins when the baby monitor blinks on, usually around 7:15 am. My husband pops out of bed to get our daughter, Frances (16 months), and brings her into our room. We snuggle for a while, and and then I try to distract her with a book or something interesting in our room so I can get ready for the day. That transition from cuddling my baby to starting the day is always a struggle. Tyler and I tag team, keeping an eye on Frances. She’s into everything these days. The morning always goes by quickly. Dress, teeth, diaper change, make bed. Check, check, check. Next we head downstairs to get the coffee going, feed the dog, and get our things together to head out the door. Breakfast is quick and on the go. Today I make some peanut butter toast, and grab a banana and a greek yogurt to eat at work. At this point in our lives, we make food — not meals. We throw things together with simple ingredients. Cooking is not our favorite activity, but we love good food. We’d probably eat out for every meal if we could. My mom arrives around 8:15 am to be with Frances for the day. We split the weekdays between my mom, Tyler, and I. We chat for a few minutes and then Tyler and I head out the door. 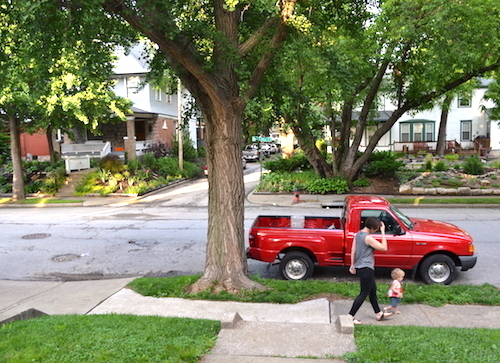 In 2009 we moved to Kansas City from Chicago, where we didn’t have a car but biked and rode public transit. 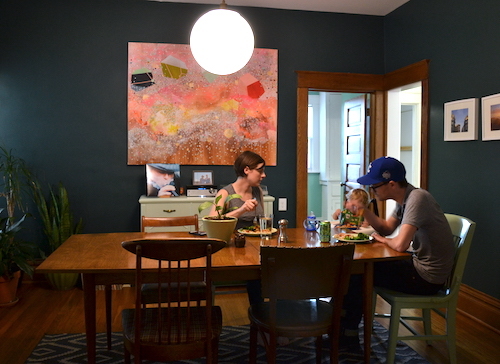 We decided to try to make it as a one-car family in Kansas City, and we’ve been able to maintain this for the past seven years. All to say, my husband and I carpool to work! We go over the day’s schedule, listen to NPR and I do my make-up on the way. Luckily, it’s a short drive, because our home is only about five minutes away from my work. 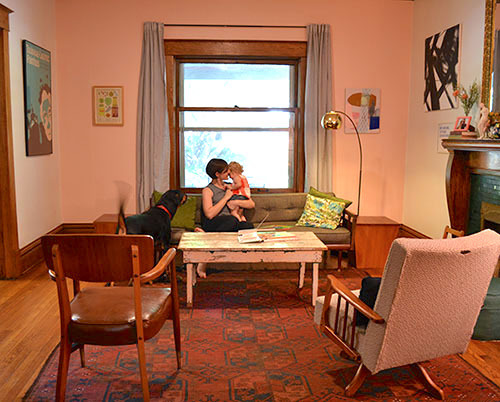 Two years ago we moved into a now 116-year old “Kansas City Shirtwaist” style house in the North Hyde Park neighborhood of Kansas City. Our intention was to shrink our circle of life in order to increase our ability to walk and bike to day to day activities. We now live within just a few miles of our jobs, church, most of our friends, and many of the things we like to do. We often go days without going more than a few miles from our house. Sometimes we don’t even get in the car, which we really like about our location. Tyler drops me off at The Nelson-Atkins Museum of Art, where I work in the Modern & Contemporary Art Departments and thus begins my day job. I settle into the day by checking emails and drinking coffee. Generally I have a few meetings at some point, so I review my day and figure out what to-dos will need to be seen to between meetings. My time is split between upcoming exhibitions, incoming new acquisitions, and general department day to day tasks. My role is very admin-heavy. Lots of emails, paperwork, reports, and project management. One thing many people don’t realize about museums is how far ahead exhibitions are planned: usually two to three years out. One year out is short-term for us. For every exhibition, there are so many moving parts and so many people involved. It’s pretty incredible. And also miraculous that we get things done! Ha. My first meeting today is a team meeting to continue planning an exhibition we have opening in the fall: Forty-Part Motet by Janet Cardiff. 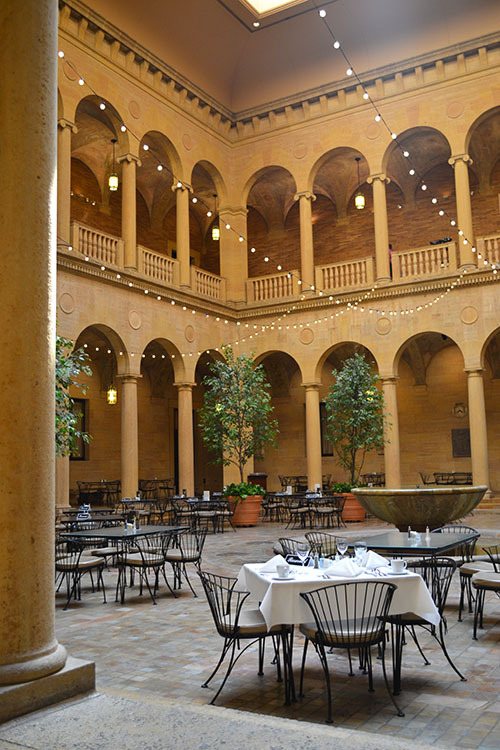 Today I’m having lunch in the museum’s restaurant with my sweet friend Rachel, who works in the African Art department. She and I were actually friends before she began working here, so it’s a treat to get to see her so often. We bonded over our shared passions for social justice and art. She’s usually the person who I’m talking to about current events and politics and making each other feel better about the state of the world. I work in a beautiful, encyclopedic museum, but being an artist at heart, the droll of office life can be draining. So it helps that I get to work with some of the best women I know, and they make my job so great. Interestingly, the majority of my museum colleagues are women. After lunch I head to our storage area where a new piece of art for the Contemporary collection was delivered and is set to be uncrated and inspected by the Conservators and Registrars. I grab a break in the afternoon and check my personal email to make sure there are not any urgent needs for my art business. I catch up on Instagram and blogs, and check in with my mom to see how the day is going at home. Tyler and I keep in touch throughout the day, so by the time it’s time for him to pick me up, we have a plan about what we’re doing for dinner and what we are doing the rest of the night. He’ll swing by the store to grab a few items. Meal planning and grocery shopping are areas we just haven’t mastered yet! Some weeks we do great at planning ahead and shopping, other weeks are just busier and and we don’t have it together and meals are game-time decisions! Dinner prep begins as soon as we get home, around 5:30 pm. I spend time with Frances while Tyler gets dinner going. We always sit down to eat as a family. We’re working on starting a business, so at dinner Tyler catches me up on what he worked on during the day, and gets feedback from me on that front. After dinner we play in the backyard and take a little walk around our neighborhood. Then I bathe Frances and start getting her ready for bed while Tyler cleans up the kitchen. I read her books, then it’s Dad’s turn. I rock her for a little while and put her down around 8 or 8:30. After Frances goes down for the night, I have a crucial decision-making moment. All I want to do at this point is go lay down and watch Netflix or read a book in bed. And sometimes I do. But tonight, I don’t. I change my clothes and go into my in-home studio. I package up prints to ship out, and do the admin side of things, like answering emails and inquiries. Then I queue up a podcast, and get to painting. Most recently I’ve been into Alec Baldwin’s podcast Here’s the Thing. I love comedy, and I’m loving his interviews with comedians and Saturday Night Live alums. I’m also enjoying The RobCast with Rob Bell and On Being with Krista Tippett. Other nights I’ll listen to music, or just have the Office or 30Rock playing in the background. Shows I’ve watched so many times, I can just listen to them. I love being a painter, but it’s still a job. It takes creative energy, and after working all day, I don’t always feel like I have that energy. I have to reach down deep to find it some nights. 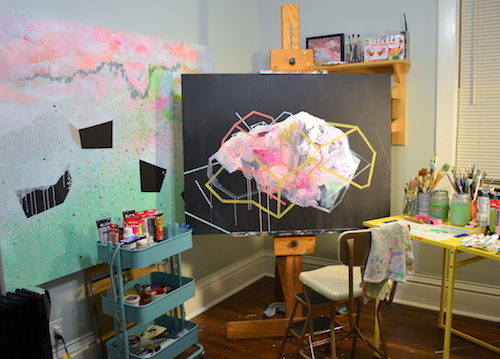 I recently took a day off of work to paint during the day, in my sun-filled studio, and it was glorious. That’s the dream. But at this moment, I have the night. I get in a zone and the few precious hours I have go by extremely quickly. It’s past midnight, and I have to get some sleep. I photograph the work I’ve done, then quickly wash my face, brush my teeth, and climb into bed. The last thing I usually think about before falling asleep for the night is my to-do list. Paintings I need to finish. Our budget. Projects we need to work on around the house. It’s hard to get my mind to quiet down. All the decisions and to-dos can weigh heavy on me. My days are full and that magical word balance just doesn’t exist in my vocabulary anymore. I finally fall asleep after doing some deep breathing exercises. I have a job (two jobs! ), a supportive community, a roof over my head, a full belly, a healthy kid, and a good guy to share my life. It’s all gonna be fine. It was a good day. Oh, Jaime. What is it about that dark time before we fall asleep? It hits us all, doesn’t it? I love the reminder of deep breathing exercises and a quick rundown of all that’s good right now. Doing it tonight. 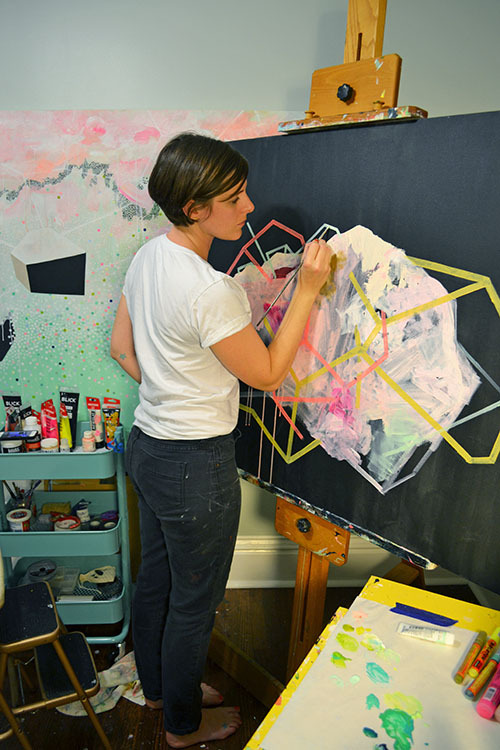 Also, I got chills when you described your day home from work when you worked on your other career: “I recently took a day off of work to paint during the day, in my sun-filled studio, and it was glorious. That’s the dream.” May your dream someday come true! 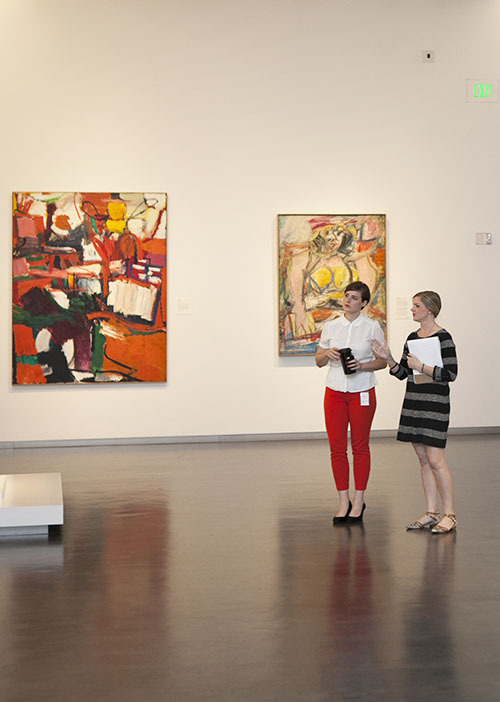 Although, your museum job sounds pretty dreamy, too. P.S. – You can see all my Call It A Day posts right here. Are you interested in sharing your unique day with us? Let me know! It’s a lot of fun…I promise! Previous Post « Do You Believe in True Love? Loved reading this post! I work in a museum on the east coast in a totally different department (museum education), and am an artist as well. I can identify with not feeling that creative energy when I get home -I’m trying to make it a point to set aside at LEAST one day a week to be art making time, that way I can mentally recharge another day. 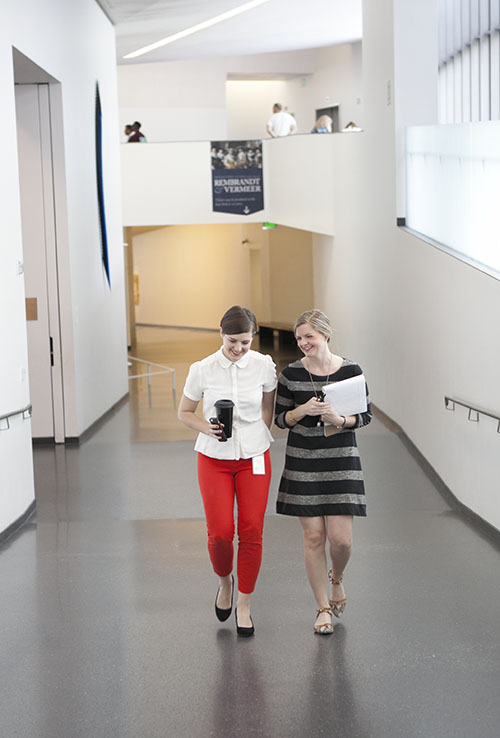 I loved this post because I’m an emerging museum professional myself! I’m finishing up my PhD with the goal to become a curator. It’s a really fascinating world, with a great blend of academia + creativity. I’ll say it because Jaime is probably too nice to, but you misspelled her first name in your title and intro. It’s a pet peeve of mine so sorry for pointing it out, but it is bothersome. She is an amazing artist and she deserves to have her name spelled correctly! Oh my goodness! Thank you for the heads up. So embarrassing! Thank you so much for sharing! When I lived in Chicago I loved being able to walk everywhere and not have to travel far for anything, it’s so nice Jaime was able to replicate that in Kansas City, I wish I could say I was able to do the same when I left Chicago. Jaime’s artwork is absolutely beautiful, I can’t wait to purchase a piece. Belated welcome to Kansas City, Jaime! The Nelson is much beloved by my family. Thank you and everyone who works there for all the talented and amazing work you do. Janet Cardiff’s Forty Part Motet was in Canada’s National Gallery for quite some time. It was one of our favorites to visit. Really lovely. Also, I would LOVE to work in a museum so I have major job envy! 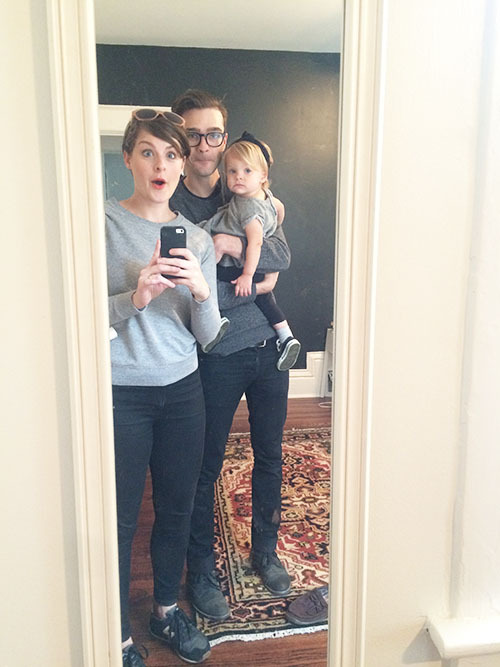 Cute family, cute house. 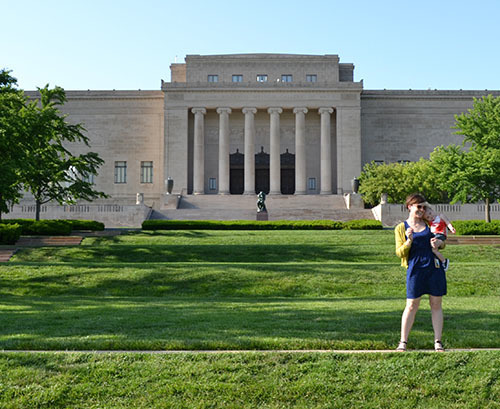 Kansas City, the glorious Nelson, and motherhood — three of my very, very favorite things! 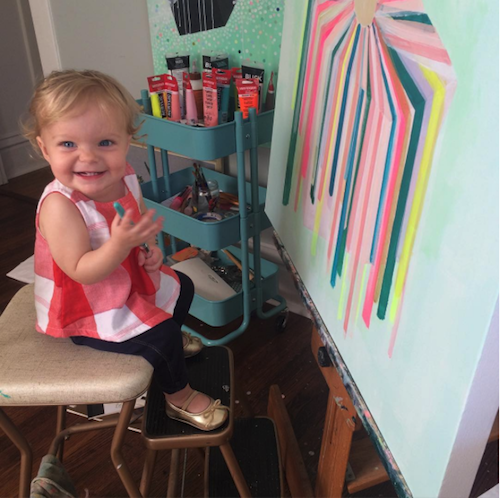 Jaime, your life looks lovely and colorful and I love your paintings! Speaking from experience it is both amazing and difficult to be balance art and kiddos, so kudos to you! Thanks everyone for your sweet comments! It was so fun to share! xo.